Let's say you're given the function f(x) = x - 3. This means that the function has been given the name f and the input variable is x. What does this function do? It subtracts 3 from the input value to give you the output. Let's say you're asked to find f(8). What does this mean? It does NOT mean f times 8. Remember, the first letter f tells you the name of the function. What's in parentheses represents the input value. f(8) tells us that we need to plug in 8 for the input value. We know that f(x) = x - 3. To find f(8), we just plug in 8 for x! f(8) = 8 - 3 = 5. Here's a few more examples in the table below. 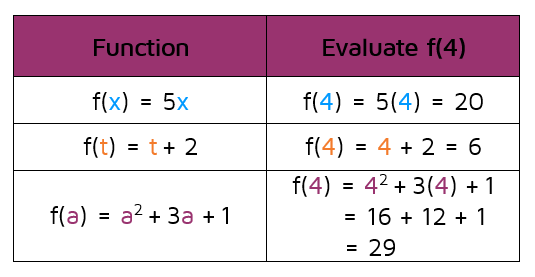 To find f(4), you just plug in 4 for the input value. Notice in the bottom row of the table, the function had two places we needed to plug in 4. If your function has more than one term with a variable, make sure you plug your input value into each one. Ready to try answering some questions about function notation on your own? Click the START button below to take a practice quiz with instant feedback. Want to learn more about functions? Check out the lesson on the Vertical Line Test.